It’s the 40th Anniversary of the famed anime series Mobile Suit Gundam and what better way to celebrate it’s four decade run than with a collaboration from Seiko. Seiko seems to be the go-to collaborator when it comes to Japanese staples, such as their latest partnership with BAPE earlier this year. With this drop, the two have teamed up to drop three watches each themed off of the mobile human-operated fighting robots. For those non-anime watchers out there, Gundam is a show that was ahead of its time. The show hit the Japanese airways in 1979, the same year of other classic cartoons such as Mighty Mouse and The Adventures of Flash Gordon. The show takes place in the distant future, year 2179, in the middle of a war between the newfound independent nation Principle of Zeon and the Earth Federation. To battle in this war, Earth Federation Forces have created giant robot fighting machines, called Gundams. Getting caught in the middle of a battle, a young boy named Amuro Ray accidentally finds an open Gundam, hops in and starts using it to fight off invaders to protect him and his friend. He soon joins the war and becomes the pilot of his own Gundam. Enough nerding out though, let’s get into the watches. 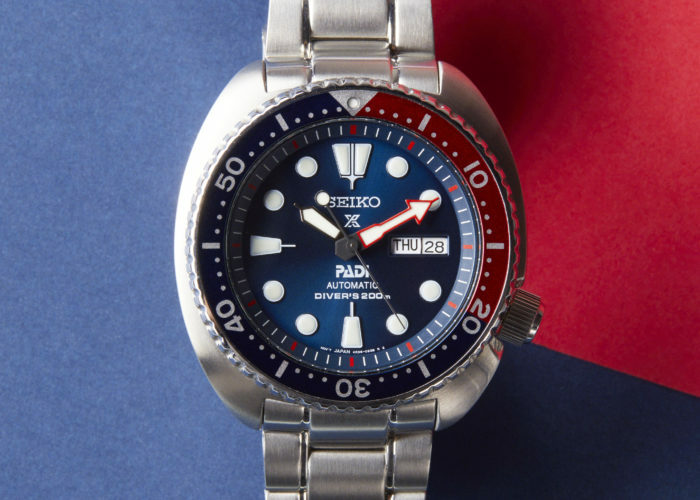 As I said in my first Fresh Set article, Seiko is the starter watch for most watch collectors, based on its straightforward designs and impeccable movements. 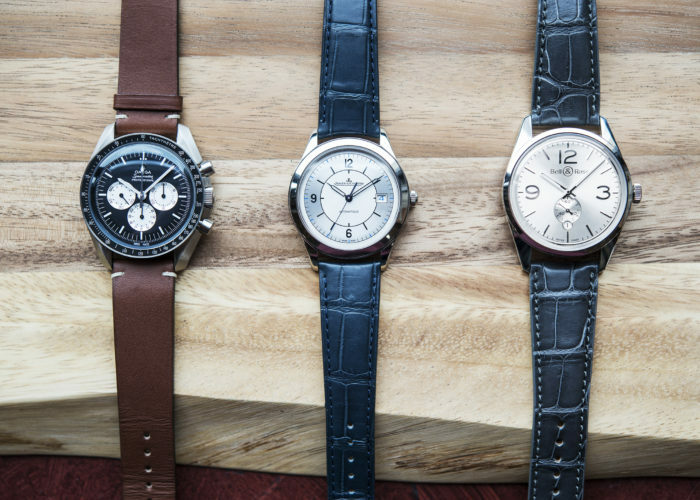 They are also some of the most collectible watches and these three are perfect additions to any Seiko enthusiasts’ set. If there is one thing that these watches don’t skimp on, are the details. 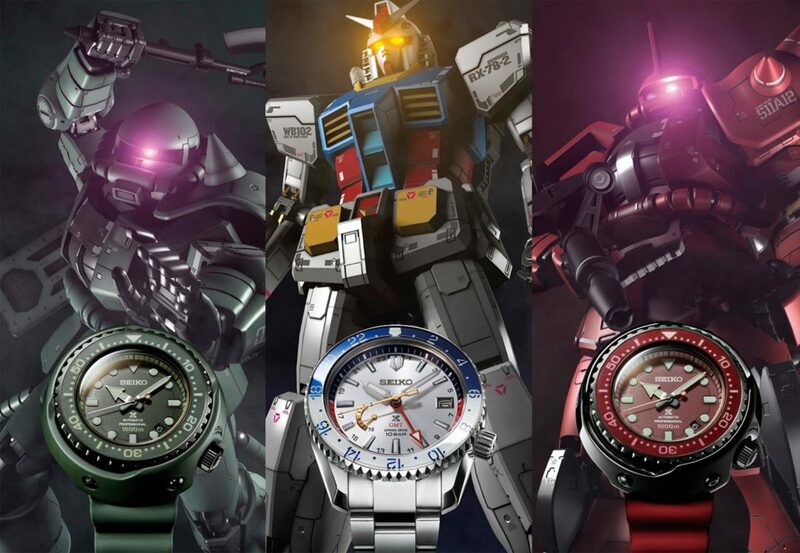 Every watch from this collaboration is designed after a Mobile Gundam suit, taking on similar color schemes to the notable battling robots. Limited to just 300 pieces, the frontrunner from the project is the SBDB033. Based off of the leading Gundam from the series, the RX-78-2, the watch’s colors and details follow suit. The sharp and clean cuts on the steel case match those of the popular animated machine, with the two-toned bezel and dial ring being the same red, white, and blue as the robot. On the case’s side is the Gundam’s RX title and Earth Federation Forces crest on the crown. If you like getting hit with childhood nostalgia, this watch from the collection does it best. The last two from the collection are the SBDX027 and SBDX028, resembling the foe Zaku II mobile suits. The watches embody the Principle of Zeon fighters with a green case on one and an entirely red dial on the other. 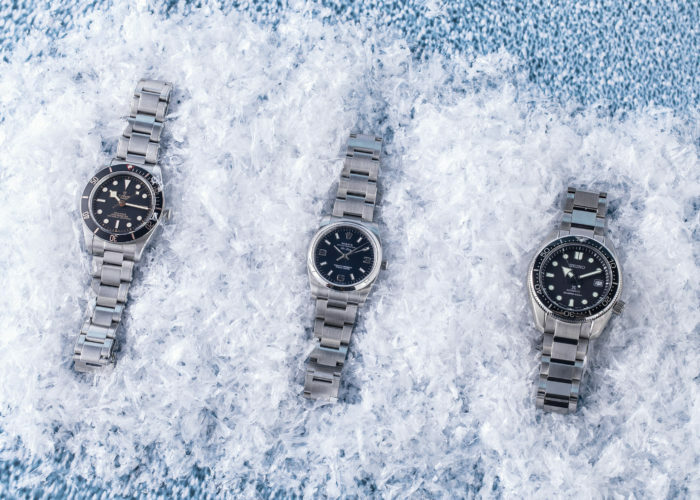 The round metal shroud that covers these watches, made popular by Seiko’s signature Tuna, match the aesthetic of the robots, being just as protective and durable. The seconds hand has a hit of purple on it to resemble the Zaku II’s glowing eye. Similar to the RX-78-2, both robots’ technical names, MS-06 & MS-06S, are stamped onto the sides of the case. Each limited to only 1,000 pieces, the SBDX027 and SBDX028 are the perfect counterpart to the Earth Federation fighter. Seiko delivered for Gundam’s 40th anniversary, making this one of the more anticipated releases for the Japanese watchmaker thus far. Since their BAPE release, they have been coming out of left field with their collaborations, being known originally from many in the watch community as a conservative, straight-to-the-point brand. From the limited run alone, this release is sure to peak the interest of many. These watches won’t be easy nor cheap to acquire, though. Each watch will release in Japan, with no domestic release in sight. The price varies between each timepiece, with the RX-78-2 coming in at $5,600 and both the SBDX027 and SBDX028 going for $3,600, a higher price point than expected for a Seiko. From looks alone though, this is a release that is not to be ignored. For our full catalog of Seiko watches, click here.